Brunch & Lunch at Ghost Ranch - Superb Day-Time Eats - Yay Baby! I’ve written about Ghost Ranch here before, I called it a jewel of a restaurant. Since that time I’ve paid the Tempe eatery a few more visits and my strong opinion of the sheer awesomeness of the place has not swayed. It is absolutely without a doubt a fabulous place to enjoy a meal. I might even call it one of my favorite restaurants, if only it wasn’t so far from me. I’m in the northwest valley and Ghost Ranch is nestled in a southeast valley strip mall 35+ miles away! Not an easy or quick drive when I get a mad craving for their epic Queso Fundido. Drooling!! 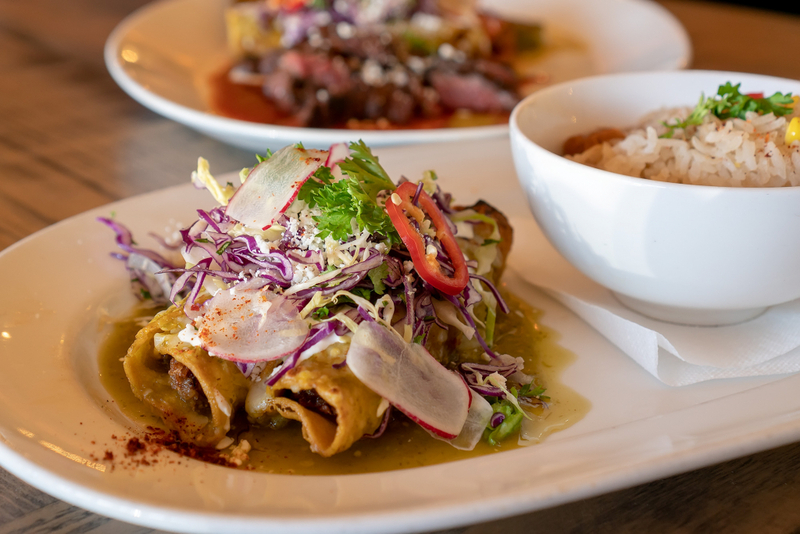 But…they do offer a lunch menu, available Mon-Fri, 11am-3pm, so when I get that hankering for their nearly perfect enchiladas I can pop in for a bite and still beat the rush hour melee on my long drive home. That helps make the long commute worth it! 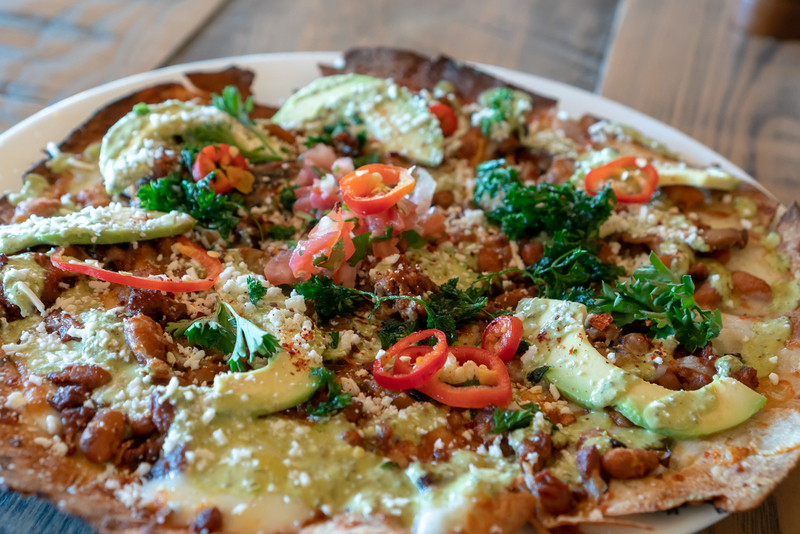 The lunch menu is an abbreviated version of the regular menu featuring their most popular items like tacos and enchiladas in smaller portions; and also a few lunch-only items like a rice bowl and a killer torta. 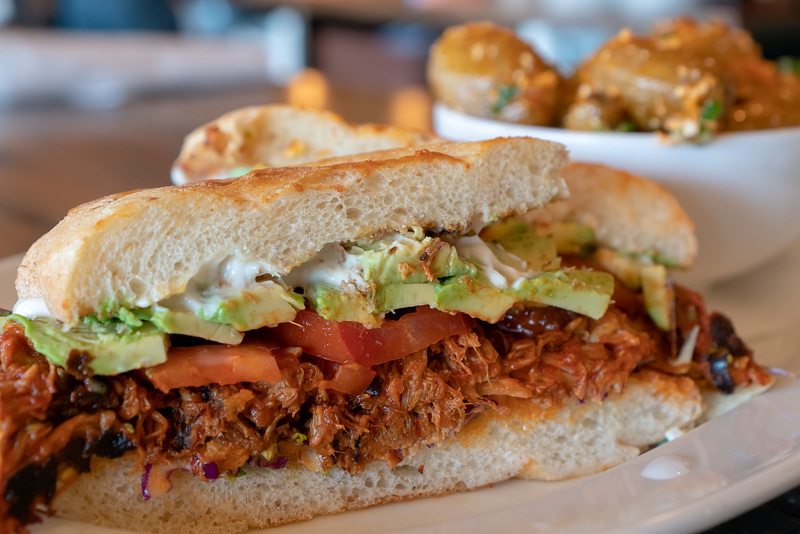 Let me tell you about that Torta! It’s freakin’ fantastic. Chimayo chile braised pork, avocado, tomato, cabbage slaw, and a creamy aioli piled atop a soft telera roll. That pork is shredded and tender with just a hint of spice and deep with flavor. 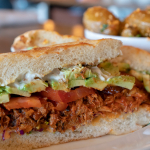 The avocado and aioli add cool, creamy layers, the tomato adds a bit of freshness and the slaw rounds it all out with a bit of bite and texture. It’s insanely good and comes served with a side salad or Rancho Papas. I opted for the latter with no regrets because I love my carbs and who wouldn’t want a pile of tiny heirloom potatoes tossed in spicy chimayo crema and cotija cheese? Just wow! The lunch enchiladas come as a pair and I deem them out-of-this-world! I love Ghost Ranch enchiladas. They are definitely different than the enchis I grew up eating. They are not drowning in sauce and cheese. I liken them more to a taquito because the tortilla is crispy and holds up to the sauce. You get your pick of pork, chicken or veggie with red or green sauce. I chose chicken with green sauce but you will not go wrong with any of the choices. There is such great texture and flavor to the enchiladas, the chicken was soft, juicy and expertly seasoned and spiced. The sauce had a little kick but didn’t overpower. The enchiladas are served with cabbage slaw and radish on top and a side of rice and beans (the beans are soooo good too). Ghost Ranch’s regular menu is available at lunch as well. 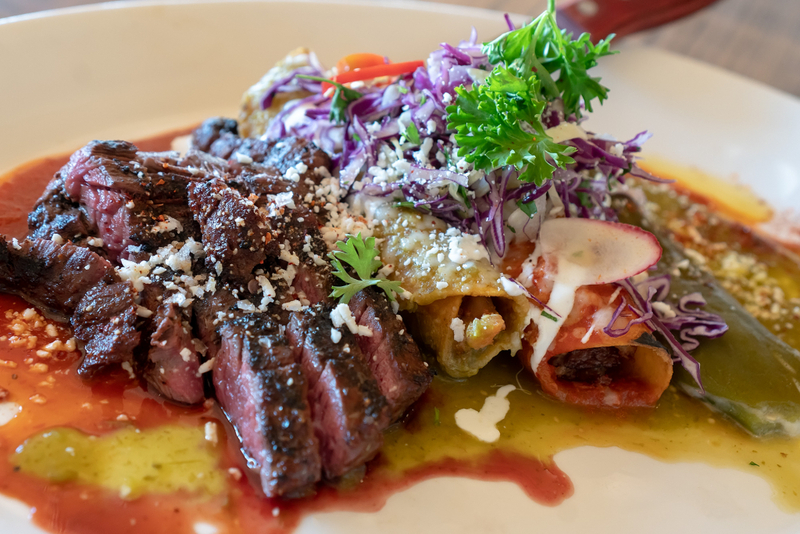 My favorite item on there is the Sampler Platter that comes with perfectly cooked, ridiculously tender skirt steak, a pork enchilada, a chicken enchilada and a cheese-filled chile relleno. It’s a bit of a splurge for a lunch time meal, but you will have leftovers and I’m willing to bet you’ll be dreaming about that steak for weeks to come! 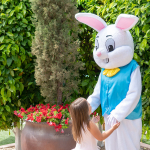 Ghost Ranch also offers an incredible weekend brunch, Saturday and Sunday from 11am-3pm. And I’m all in, because commutes are never as bad on the weekends! 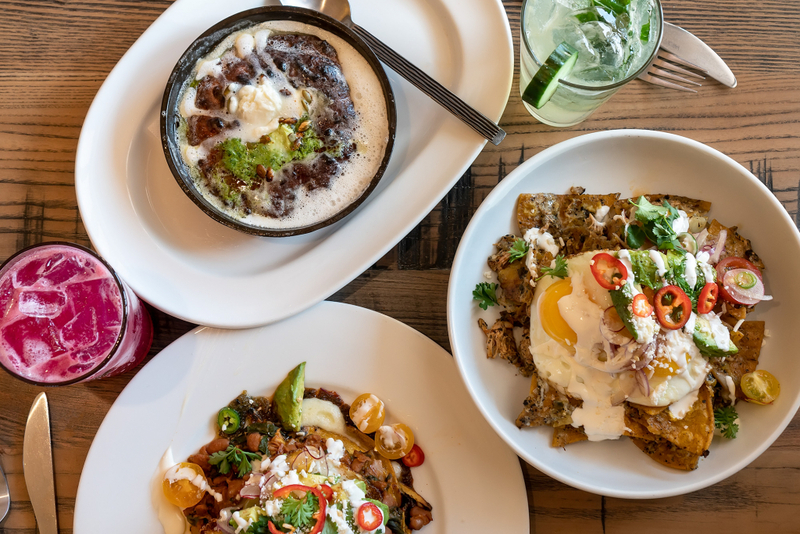 Brunch specialties include a blue corn pancake, chilaquiles, breakfast burritos and the signature Ghost Ranch Breakfast. I like to splurge at brunch, a reward for getting through the long week and a pick-me-up for the week to come. 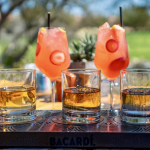 Brunch should also include cocktails, a few dishes and great company to share it with. We started with the Queso Fundido to get our appetites jump started for our late morning southwestern feast. 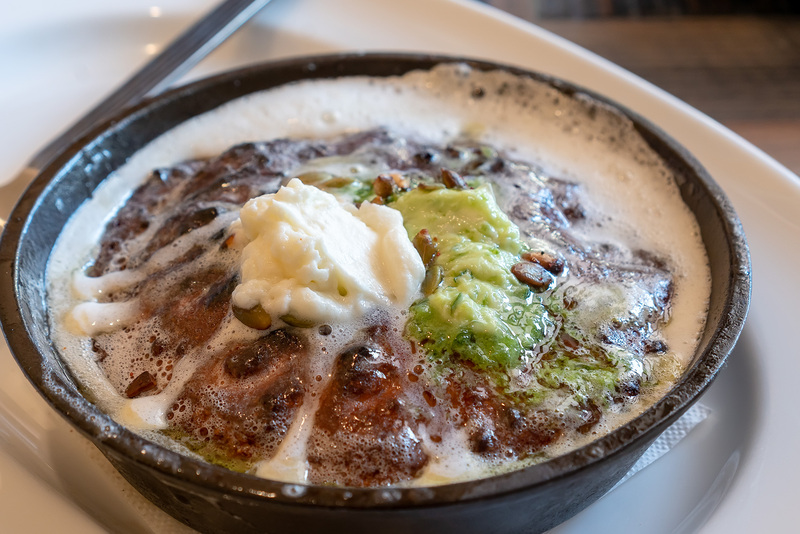 Ghost Ranch’s Queso Fundido is truly the best in town. A skillet of ooey, gooey, melty cheese and spicy chorizo served with piping hot, freshly-made corn tortillas. It is so good, so, so good! 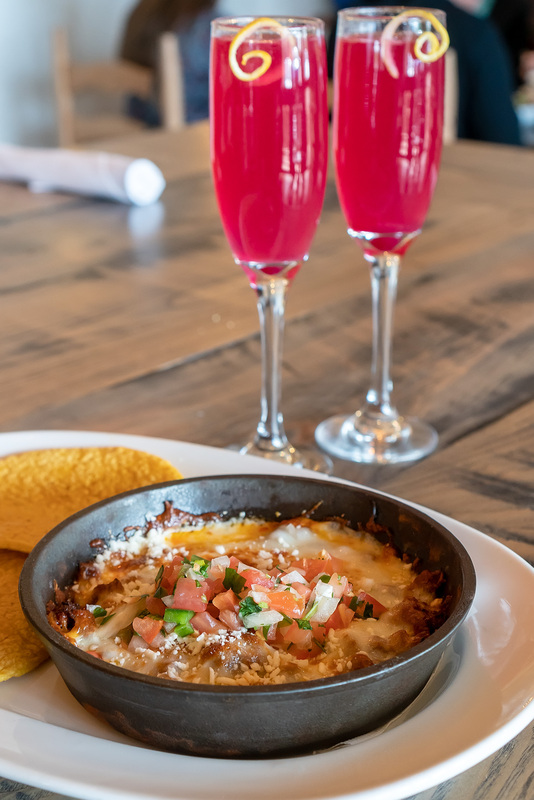 We enjoyed our sizzling molten cheese with bright pink Prickly Pear Bellinis, a crisp blend of prickly pear puree and sparkling wine. An ideal brunch cocktail, refreshing and perfectly sweet. After we fought over the remnants of the Queso Fundido we ordered another round of bellinis and got to work on our entrees. I prefer a savory breakfast but I’m a firm believer that brunch should include an element of sweet. My brunch buddy agreed so we each ordered something savory and shared the Cast Iron Blue Corn Pancake. The pancake was more like cornbread…in the very best way. It was fluffy and thick, rich and buttery with corn kernels studded throughout. It came topped with whipped cream, honey and toasted pepitas. It wasn’t overly sweet and at times was even a bit savory but that whipped cream and honey satisfied my craving for a morning treat. 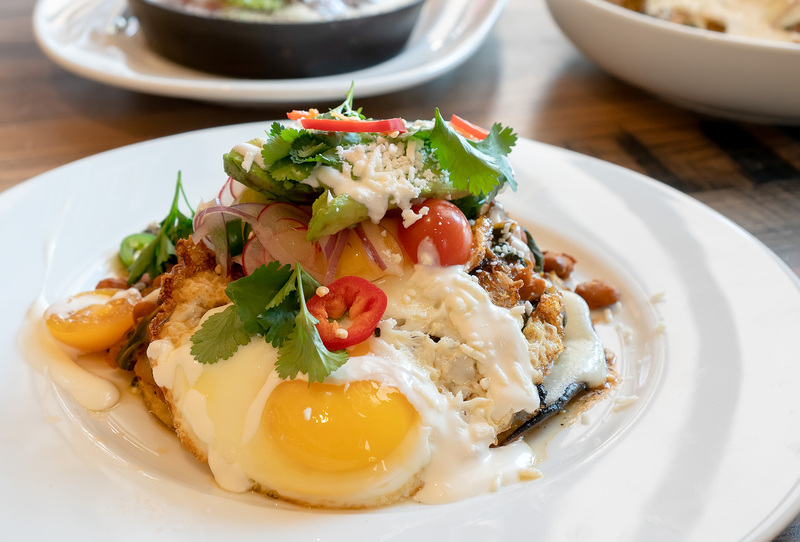 For my entree I chose the Ghost Ranch Breakfast, a layered dish that included a blue corn quesadilla, braised greens, adobo pork, sunny side up egg, pico de gallo, avocado and red and green sauces. There was a lot going on in this dish, a lot of glorious deliciousness! There were lots of flavors and textures; smoky spiced pork, creamy avocado, richness from the egg yolk, freshness from the pico and a savory earthiness from those braised greens. Each bite offered a different flavor combination and made for an incredibly tasty and hearty breakfast. My friend chose the Chicken Chilaquiles and I am very thankful we decided to share our selected entrees because her chilaquiles were delicious! Each and every chip was perfectly coated in the tomatillo serrano sauce, the seasoned chicken was generous throughout, the chips held their integrity and remained crisp. 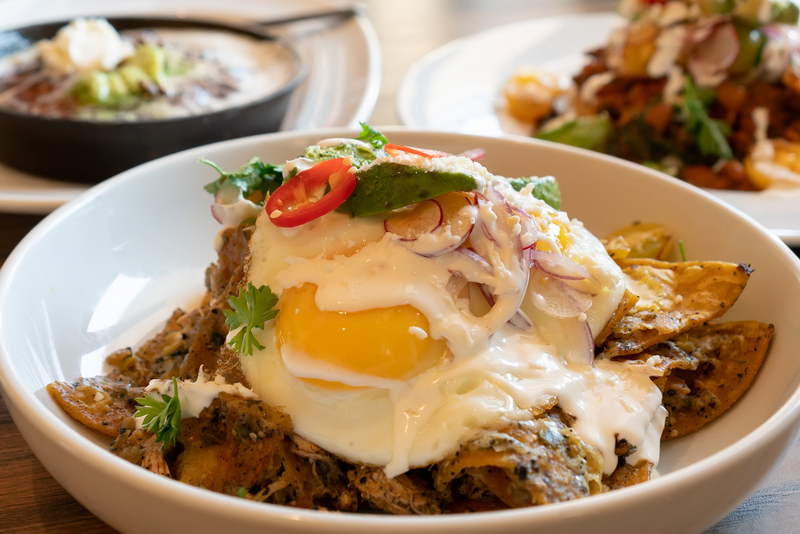 The chilaquiles came topped with Oaxaca cheese, avocado, scallions, crema and a sunny side up egg. All the flavors complimented each other, married into a perfect rendition of this classic Mexican comfort food. A simple dish taken up a few dozen notches in flavor and presentation. Nice work Ghost Ranch! 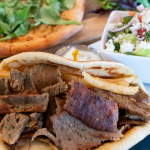 If you live in Tempe or within a 15 mile radius of Ghost Ranch I envy you, you have one of the Valley’s best eateries at close range. Lucky ducks! Ghost Ranch is a bit of a hike for me but thankfully their lunch and brunch offerings add even more incentive for me to visit at more convenient times during the week or on the weekends. But heck, I really don’t need much incentive to visit this Valley gem, Ghost Ranch is well worth the drive! Disclaimer: I enjoyed these meals at Ghost Ranch free of charge in exchange for this post. All opinions are entirely my own.